The softest, fuzziest, sweetest toys you have ever seen, The Little Market’s alpaca stuffed animals are handmade by female artisans in Peru. Not only will the adorable designs of these teethers make you chuckle, but they are made from naturally antibacterial and non-splintering maple wood that is perfect for delicate gums. This gift set from cult favorite, all natural bath line Tubby Todd literally smells like Christmas. The lotion is a candy cane encapsulated, the bubble bath is scented with cranberry mandarin, and the shampoo has the most delightful vanilla cake smell. This beautifully designed book acts as a visual encyclopedia of first words to see and say with your baby. It covers everything from space to the human body to the world around us. Monroe Workshop designs the coolest collection of simple yet innovative wooden toys made from scraps from their furniture line. Any one of the animals in the collection will be a surefire hit. 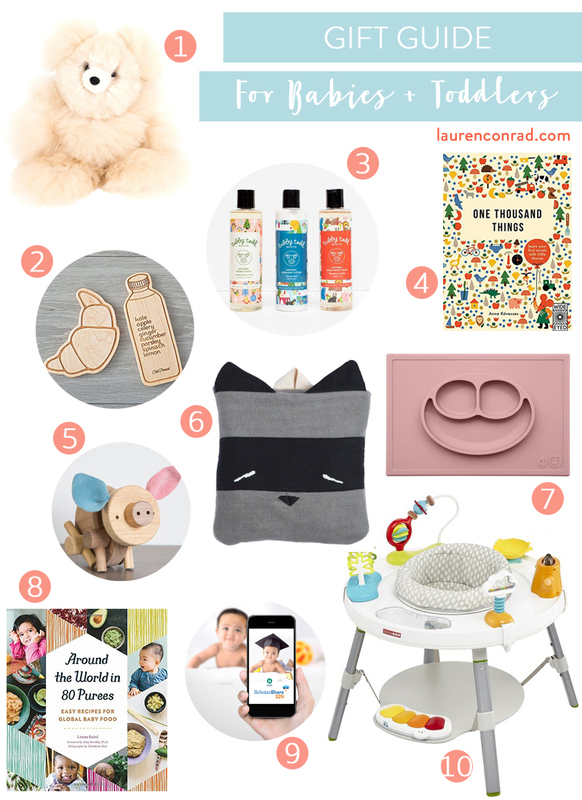 Perfect for tummy time or trips to the park, these organic cotton baby blankets from Lauren’s shop The Little Market fold up into an adorable animal face pouch. Now available in Team LC-approved pastel shades of blush and sage, these EZPZ mats capture your kid’s mess with a placemat and plate all in one. If you plan to start with purees, this cookbook will expose your baby to a world of flavors and spices from the get-go, inspired by the cuisines of India, China, France, Mexico, Morocco, and beyond. We can’t think of a more important and practical gift than a contribution to baby’s 529 Savings Plan for college. College tuition is higher than ever, and a ScholarShare 529 plan empowers families to start saving when your kids are small. With both eGift options and downloadable gift certificates, it makes for a very meaningful holiday gift. This seems to be everyone’s favorite activity center. Babies have a blast in this thing! Easy to assemble, with toys that can be positioned anywhere, it features a 360-degree rotating seat that turns and stretches for bouncing. A fun gift for your fashionable little one, this pint-sized heart purse is hand-woven with recycled fabrics by refugee women living in the U.S.
Give the gift of hours of make believe with this reversible cape and super hero hat made from 100% natural cotton canvas and printed with eco/child friendly water-based inks. Make bedtime a little more fun with some shadow puppet theater before saying goodnight, featuring circus whimsical designs from French toy company Moulin Routy. A fascinating read for inquisitive kids, this book follows the real lives of seven kids from Italy, Japan, Iran, India, Peru, Uganda, and Russia for a single day. It provides a thoughtful window into traditions that may be different from our own, as well as a mirror reflecting our common experiences. Budding botanists and nature lovers will adore this device for pressing and drying flowers that they collect. Dream dollhouse alert. This beautifully crafted wooden dollhouse from Chip & Joanna Gaines’ new line will bring a touch of nostalgia to your kiddo’s playtime. For the little one who loves to match mommy, this celestial bracelet set comes in 14k yellow, white, or rose gold. If you’re going to splurge on the play kitchen below, it wouldn’t be complete without a proper dutch over to go along with it. This replica of the classic Le Creuset cookware is too cute. Another winner from the Chip & Joanna Gaines’ line, this 38-piece set has everything your little one needs to pretend to build and fix things around the house. Gold hardware? White cabinetry? This Pottery Barn Kids play kitchen is a mini replica of the cooking space of our dreams. 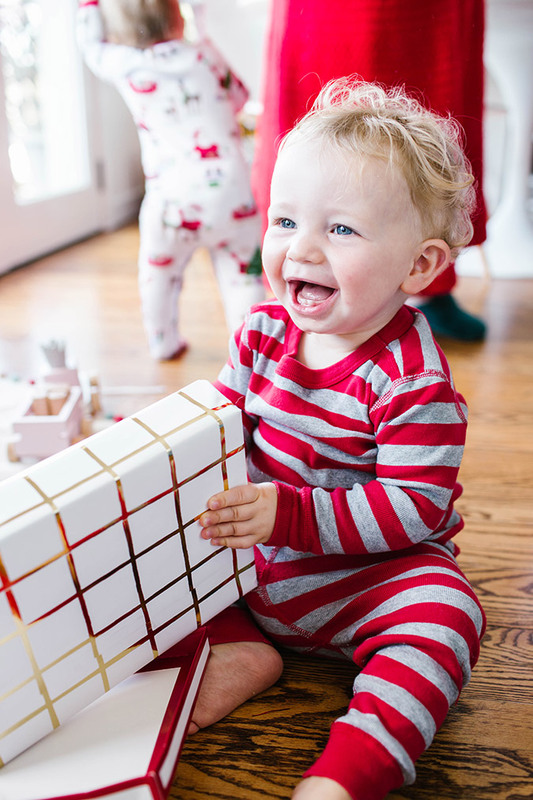 What will you be getting for the little ones on your list? We hope this post gave you some great ideas!